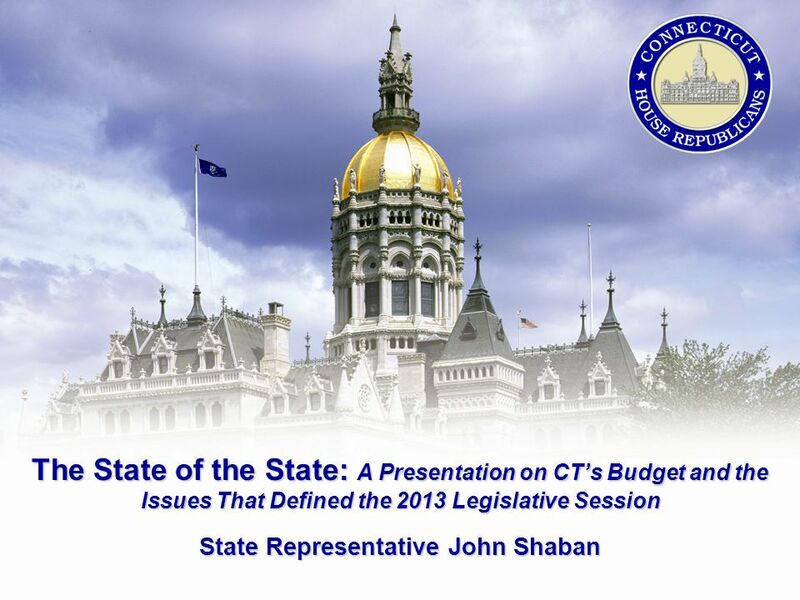 The State of the State: A Presentation on CTs Budget and the Issues That Defined the 2013 Legislative Session State Representative John Shaban. 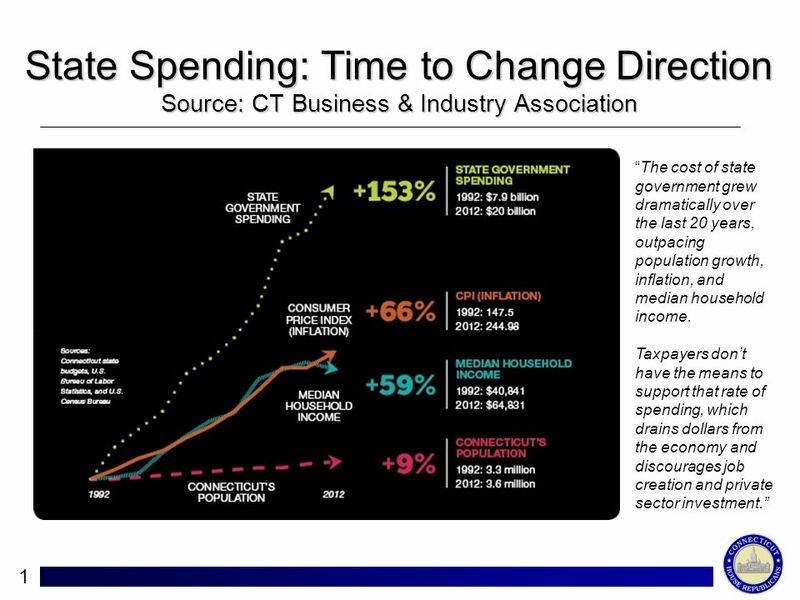 2 State Spending: Time to Change Direction Source: CT Business & Industry Association 1 Ll The cost of state government grew dramatically over the last 20 years, outpacing population growth, inflation, and median household income. Taxpayers dont have the means to support that rate of spending, which drains dollars from the economy and discourages job creation and private sector investment. 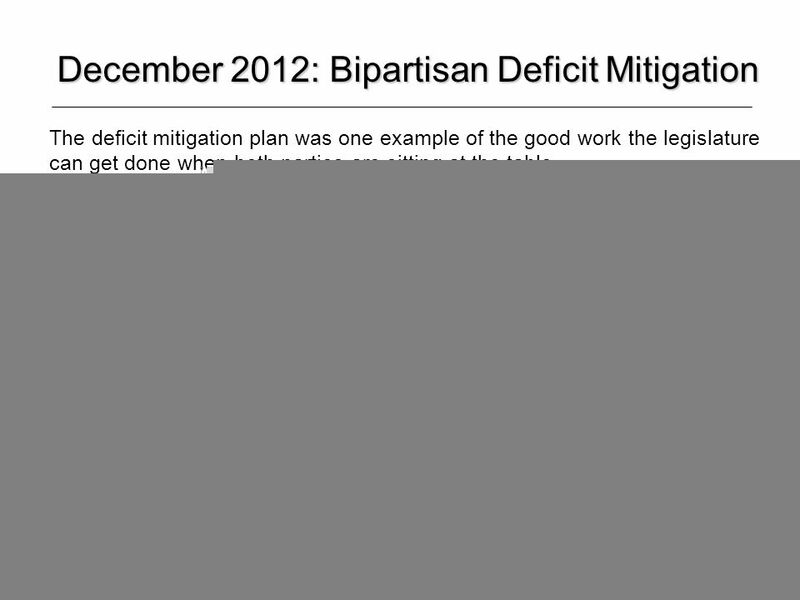 5 4 December 2012: Bipartisan Deficit Mitigation The deficit mitigation plan was one example of the good work the legislature can get done when both parties are sitting at the table. 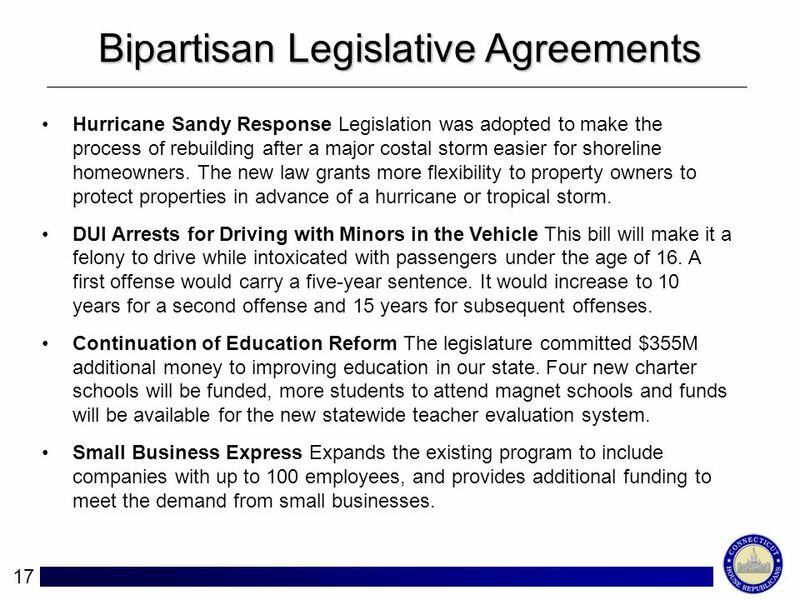 We passed the first budget-related bill in a long time that had no tax increases. 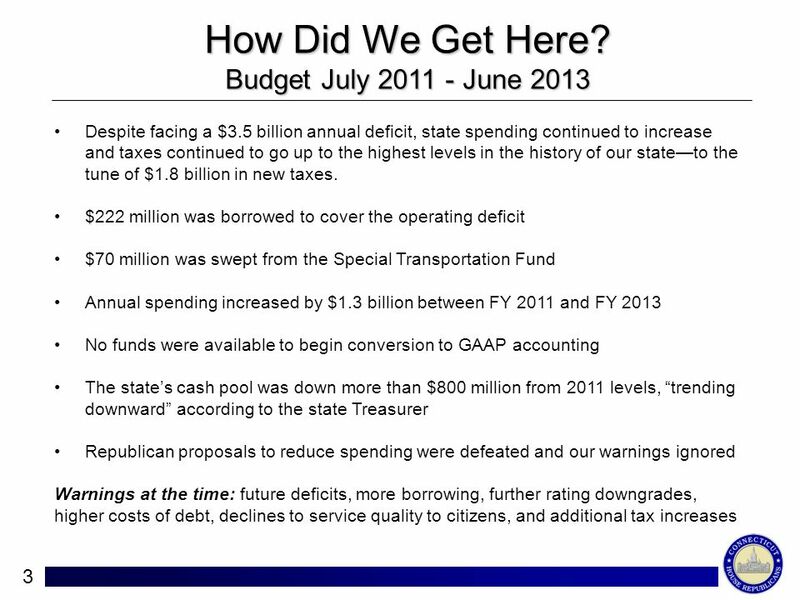 The plan closed the ENTIRE budget deficit, with legitimate spending cuts. 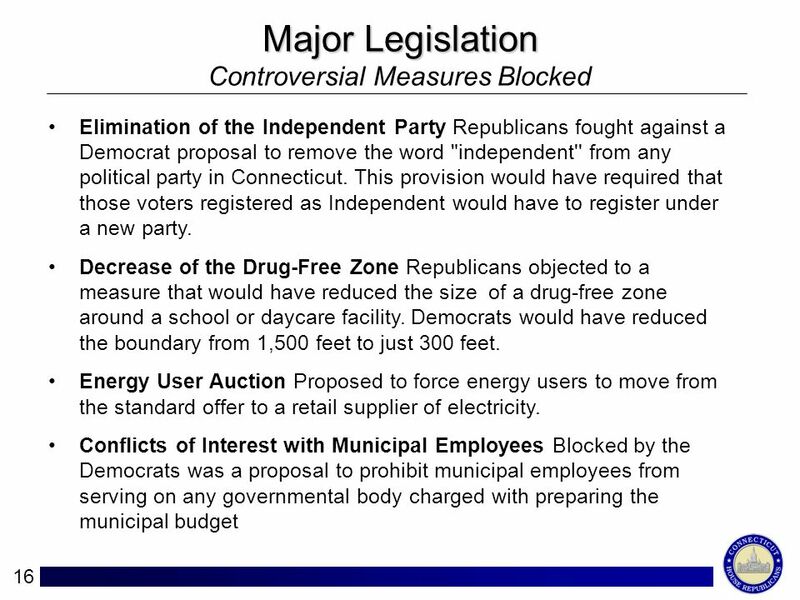 Aid to municipalities was left virtually untouched - sparing property owners unexpected tax increases relating to state aid. 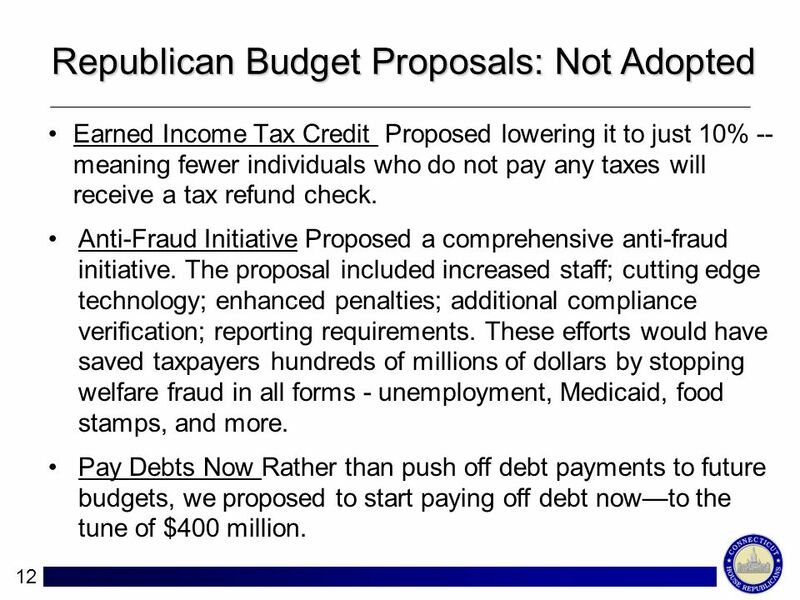 Republicans attempted to make significant reductions to the Earned Income Tax Credit; in the negotiating process, we had to settle for a commitment to reduce rampant fraud in the EITC. 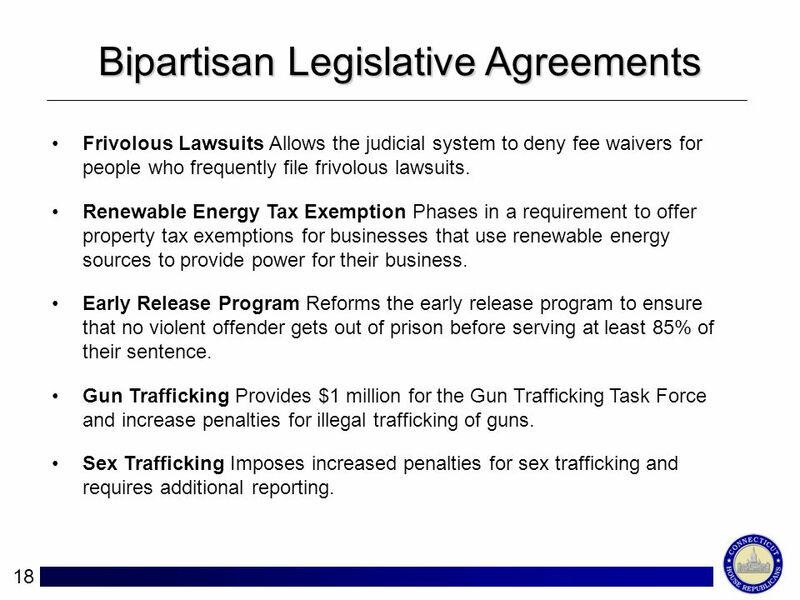 Going into negotiations, proposals to increase taxes on businesses, consumers, and energy generators seemed imminent, but our strong opposition resulted in the rejection of these proposals. 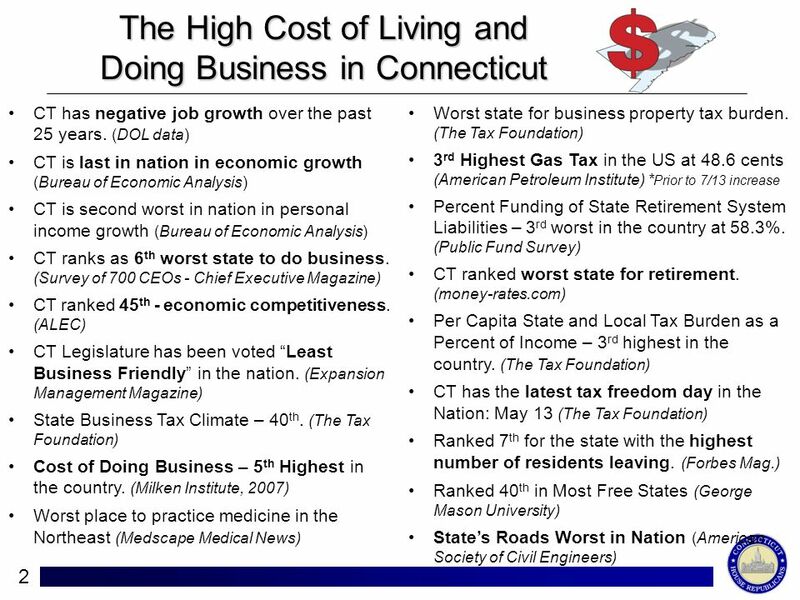 11 10 Businesses are concerned about the budgets spending increase and one-time revenues that do little to get Connecticut off its cycle of deficits, debt, and taxes. The budget will not instill the confidence that businesses need in order to plan ahead and make the job-creating investments necessary to drive the states economy. 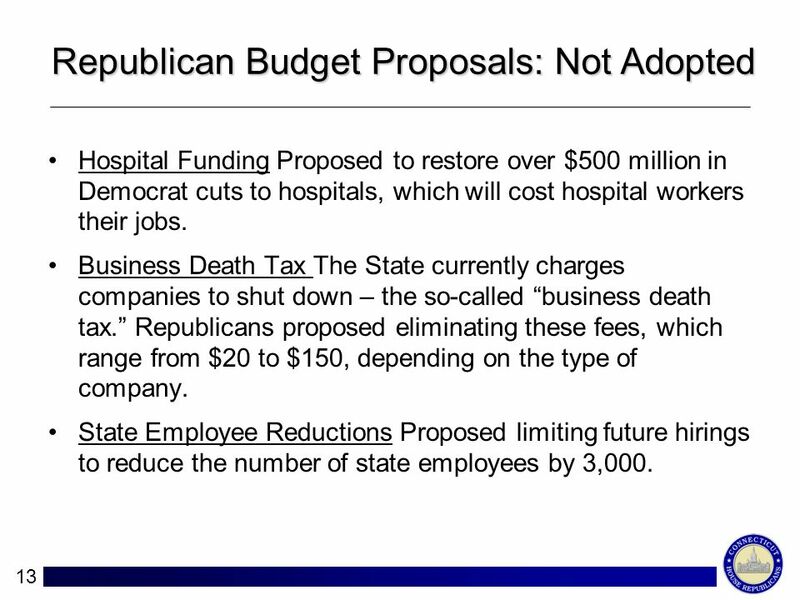 Business Death Tax Not only do we require businesses to pay a tax of $250 to open its doors, but we also require a fee when a business closes their doors, too. Gas Tax Increase On July 1 st a portion of the gas tax will increase by almost 17%. 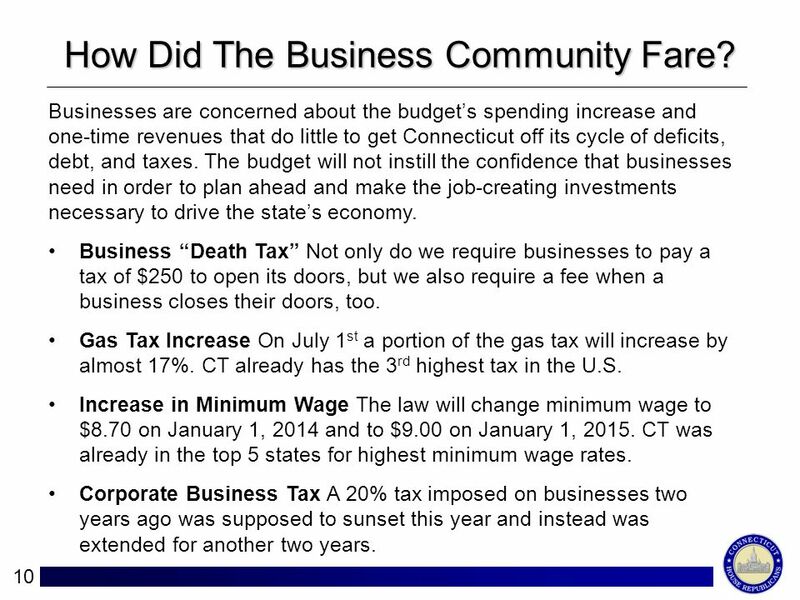 CT already has the 3 rd highest tax in the U.S. Increase in Minimum Wage The law will change minimum wage to $8.70 on January 1, 2014 and to $9.00 on January 1, 2015. CT was already in the top 5 states for highest minimum wage rates. Corporate Business Tax A 20% tax imposed on businesses two years ago was supposed to sunset this year and instead was extended for another two years. How Did The Business Community Fare? 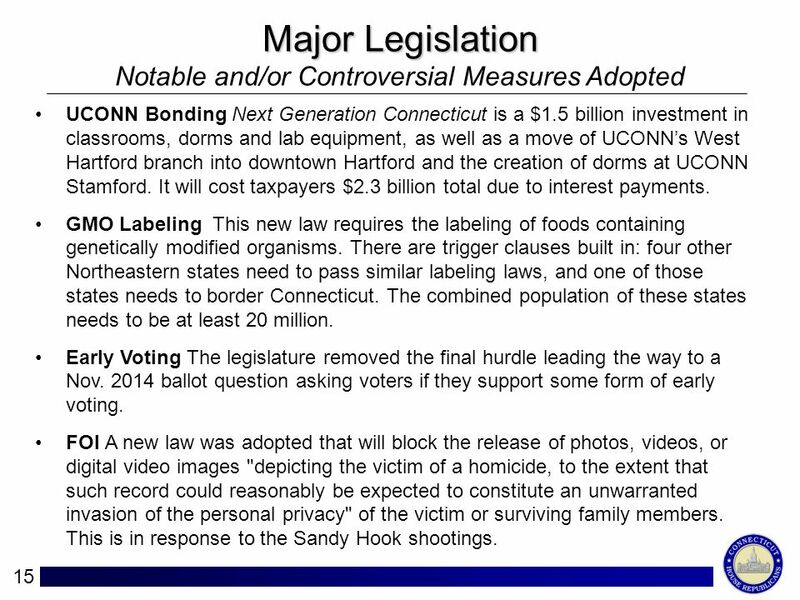 16 15 Major Legislation Notable and/or Controversial Measures Adopted UCONN Bonding Next Generation Connecticut is a $1.5 billion investment in classrooms, dorms and lab equipment, as well as a move of UCONNs West Hartford branch into downtown Hartford and the creation of dorms at UCONN Stamford. 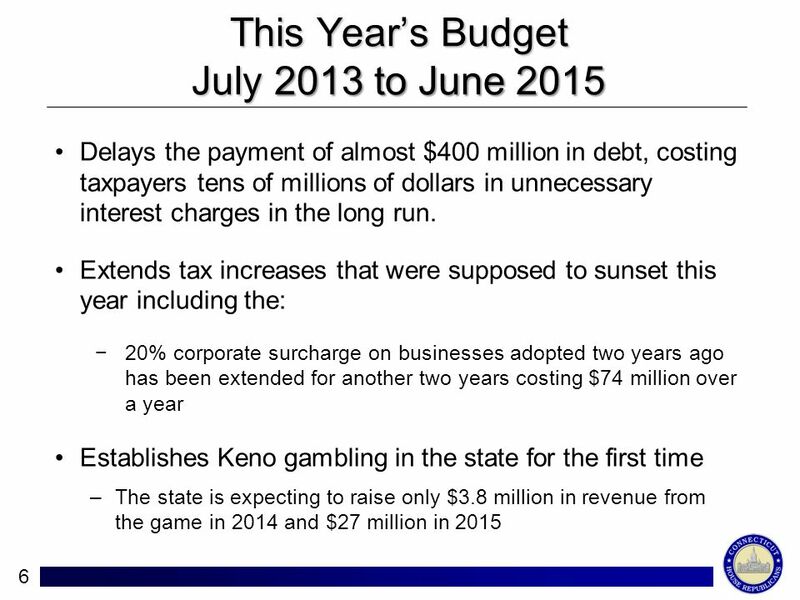 It will cost taxpayers $2.3 billion total due to interest payments. GMO Labeling This new law requires the labeling of foods containing genetically modified organisms. 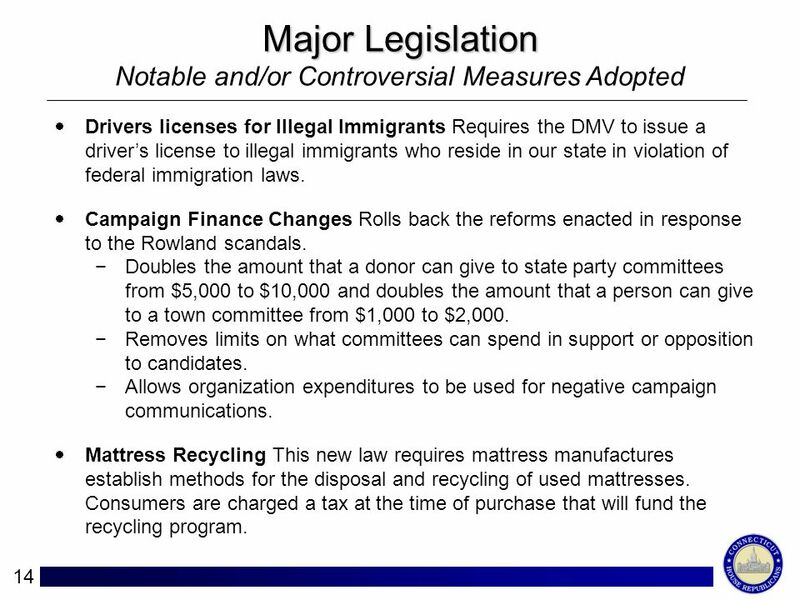 There are trigger clauses built in: four other Northeastern states need to pass similar labeling laws, and one of those states needs to border Connecticut. The combined population of these states needs to be at least 20 million. Early Voting The legislature removed the final hurdle leading the way to a Nov. 2014 ballot question asking voters if they support some form of early voting. FOI A new law was adopted that will block the release of photos, videos, or digital video images "depicting the victim of a homicide, to the extent that such record could reasonably be expected to constitute an unwarranted invasion of the personal privacy" of the victim or surviving family members. This is in response to the Sandy Hook shootings. 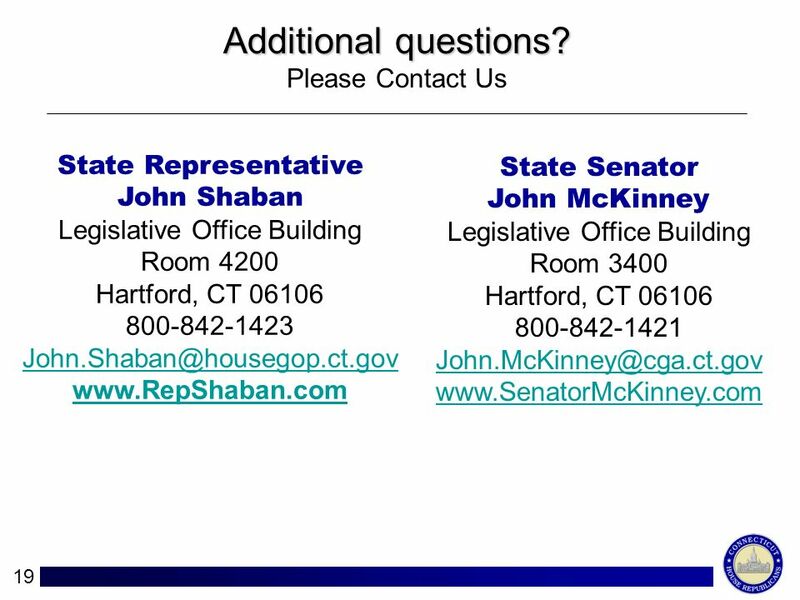 Download ppt "The State of the State: A Presentation on CTs Budget and the Issues That Defined the 2013 Legislative Session State Representative John Shaban." Government Spending Matt Timmons Vince DAlanno Dan Curtis. Chapter Twelve The Citizen in Government Paying for Government ~~~~~ Raising Money. Presentation to AAA meeting 11 January 2014 Troika exit – can there be a recovery? Reality v propaganda Underlying weaknesses in economy How can there. 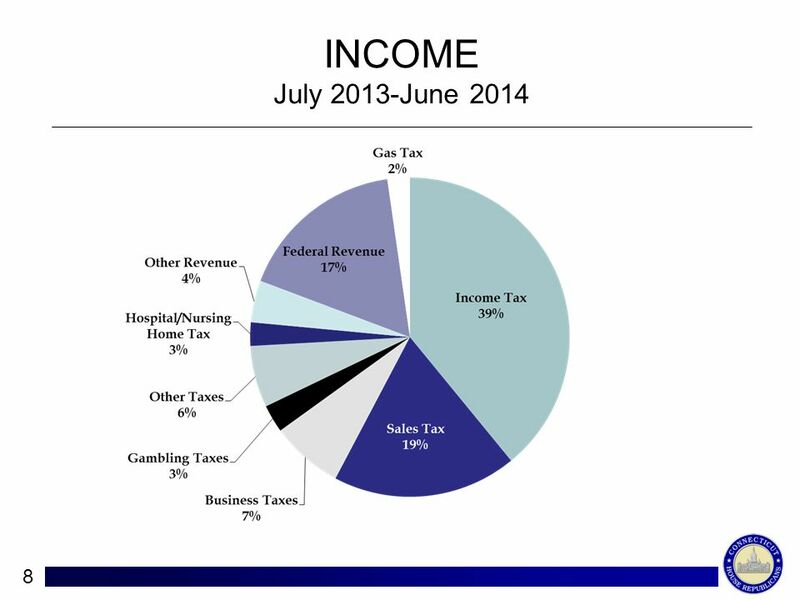 City of Miami PROPOSED Fiscal Year 2009 BUDGET. 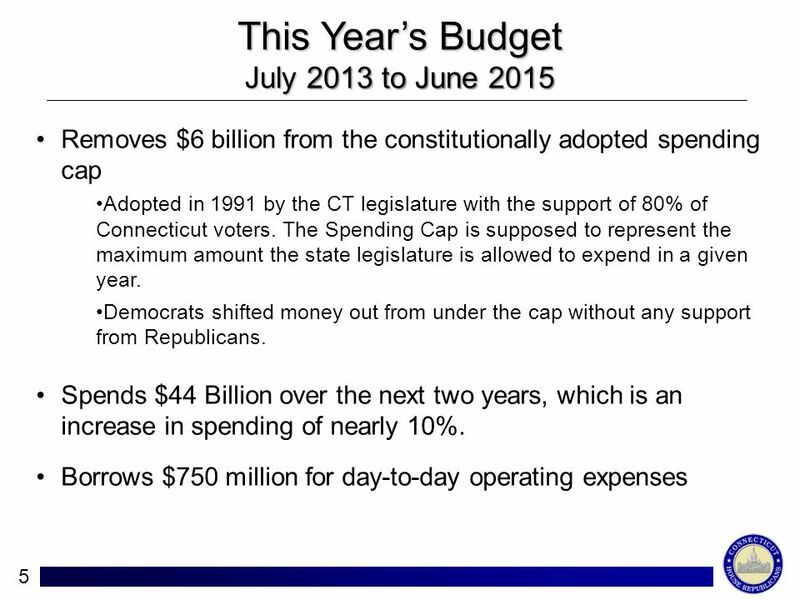 2 Budget Focus To prepare a structurally balanced general operating budget. 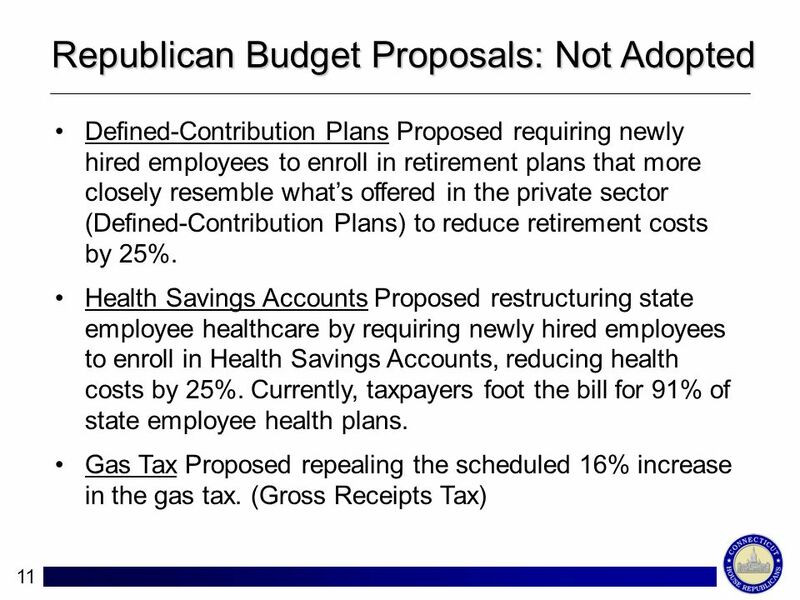 To provide a budget, which. 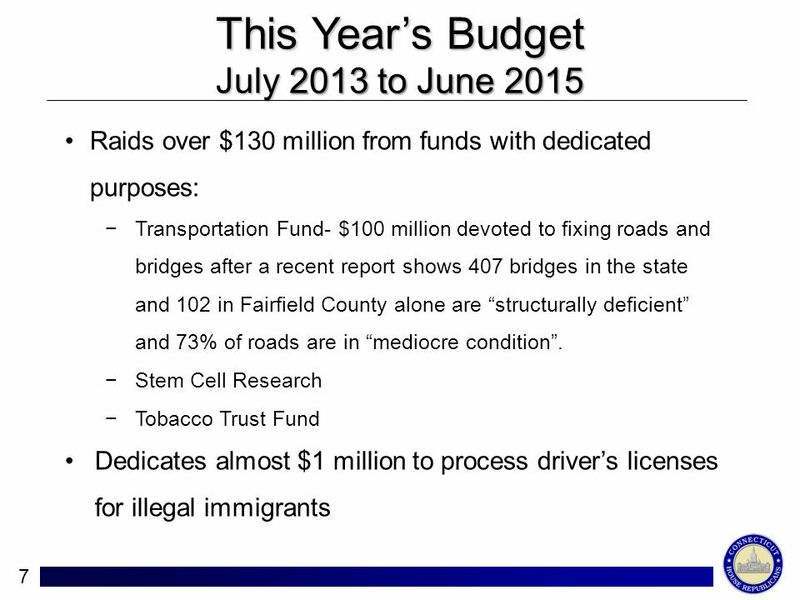 1 Town of Colchester FY 12 Budget. 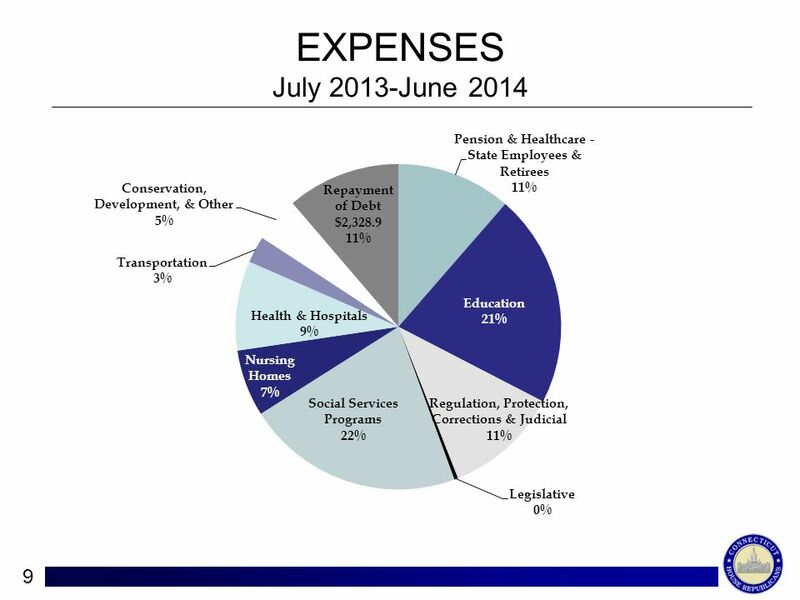 2 Current Financial Challenges Vermont and the nation are coming out of a recession Expenses rarely go down.